If you do any sous vide cooking at all, you have most likely encountered a stubborn bag of food that just wouldn't sink. 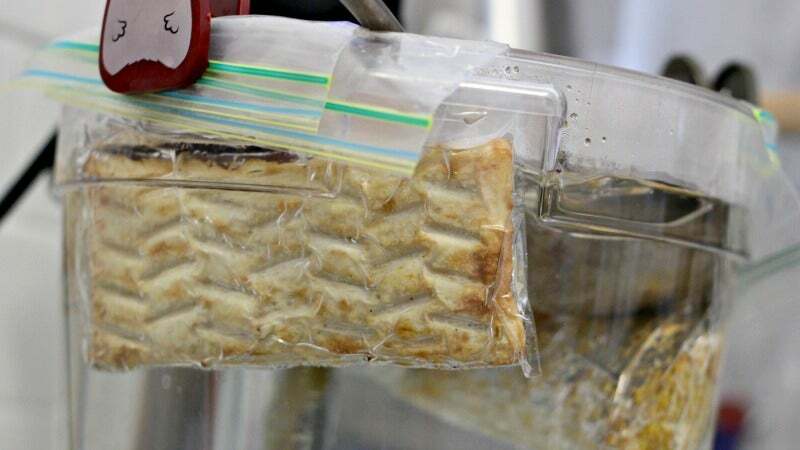 A vacuum-sealing system virtually eliminates this issue, but if you're not ready to invest in the pricey piece of equipment, Anova Culinary has some helpful tips for keeping your bags submerged. Use a Rack: Dish drying racks, file organisers and lid organisers can all help hold bags in place, keeping them from drifting to the surface. Weigh it Down: A butter knife (or two) inside the bag can keep it from bobbing and — since they're made from food grade stainless steel — they won't contaminate your meal. You can also clip a bag of change or pie weights to the outside of the bag, meaning you don't have to fish out and clean a butter knife. Enlist Your Steamer Basket: Not only can an inverted steamer basket keep your food in place while allowing water to circulate, but it can also "provide a foundation upon which to place additional weights, like heavier ceramic bowls, plates or even just coffee mugs, water glasses, or Mason jars you place water into".